Fuzzy, sweet and fragrant, peaches are one of the most popular members of the fruit family. If you know how to pick a good one, they make for a heavenly, healthy snack. 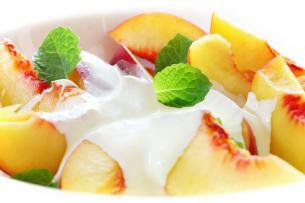 Peaches have also inspired many great summer desserts, including Peach Melba and peach cobbler. Some of us love the flavor of peaches but aren’t crazy about their fuzzy faces. Keep in mind that most of that comes off when peaches are washed. If you’re still not a convert, you’ll find a similar taste and texture in nectarines, the smooth-skinned cousins of peaches. Try substituting nectarines for peaches in any of the recipes below. Peaches are on the softer spectrum of fruits, so handle them with care. Ripe ones should be firm, but have some give. Look for ones with a gold skin tone, rather than greenish or red. In terms of shape, a definite cleft is an indication of a mature fruit. Freestone peaches (as the name suggests) have stones that are easier to remove than clingstone peaches. It’s best to store them at room temperature, and wash them just before you want to eat or use them. They’ll last around four days, maybe a bit longer if you refrigerate them in a plastic bag. To remove the stone, cut into the peach near the top until the tip of the knife hits the stone, then cut lengthwise around the stone. Gently hold both halves of the peach, twist in opposite directions and pull it apart. Put one side down and then loosen the stone from the peach flesh with a knife or your finger. Fine Cooking offers a great photo tutorial on pitting peaches. If you’re a real peach fan, you can buy a tool specially made for removing peach pits. Peaches will oxidize when cut and exposed to air, but a squeeze of lemon juice will stop them from turning brown. You don’t have to wait until dessert to eat peaches. Fresh peaches make a great addition to salads, because of the sweet contrast with the vegetables. You don’t need a recipe; just add them to whatever combination of greens and vegetables you like. Here’s another salad idea for anyone trying to use up slightly under ripe peaches. Making a batch of peach salsa will perk up any grilled fish or meat. Peaches are often partnered with pork, as in this Pork Chops with Peaches recipe. Chicken and Peach Curry calls for canned peaches rather than fresh, but it’s an easy weeknight dinner recipe. Now, onto dessert! You’ve heard of peaches and cream, but a lesser-known pairing is peaches and wine. Simply soak peeled peaches in wine “for as long as you can stand it”. That’s it! Here’s a simplified version of peach melba, which is traditionally a cool combination of peaches, raspberry sauce, ice cream and liqueur. This recipe uses raspberry jam as a shortcut to the sauce. 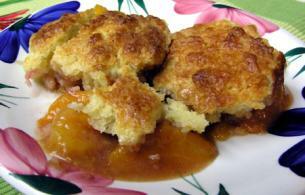 Here’s a classic: Peach cobbler (pictured below). This bourbon-spiked version (modified from a Tyler Florence recipe) has “the tenderest crumb I have ever tasted,” says Mimi at Delectable Tidbits. Peach Cobbler has a yummy, crumbly top. Photo courtesy of Mimi at Delectable Tidbits. Grilling is a popular way to prepare peaches because it brings out their sweetness. Here’s a recipe for Grilled Peaches with Bourbon Vanilla Whipped Cream, which can be done indoors using a grill pan. If you don’t have or don’t like bourbon, stick to plain whipped cream. 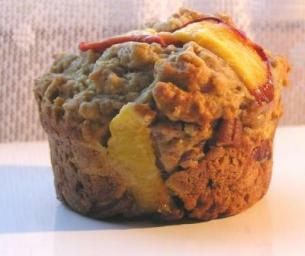 These Peaches and Cream muffins provide a way to get peaches into your morning breakfast. There’s actually no cream in the recipe; the muffins get their oomf from low-fat ricotta cheese and skim milk. I can’t thank you and your colleagues enough, Jessica, for the guides to selecting seasonal produce. I’m finding them very helpful. The Seedling Cafe Dominic: Organic Chicken Salad with Fresh Apricots, Fresh Peaches, Fresh Raspberries, Blueberries, Coconut Candied Cashews, Raspberry Aioli, Organic Baby Spinach on a Spinach Wrap and Grilled. Peaches are like tomatoes to me: they just taste like summer. There is a site reposting your content. I suspect it is without your permission, as they are doing the same with mine. I have emailed them demanding they stop violating my copyright. You might want to do the same. I will let you know when/if I hear back from the site owner. Shaula, you are so right – peaches and tomatoes just scream out SUMMER! In fact as far as I’m concerned it is about the only thing I like about summer. I can’t wait for the heat and humidity to be over. I’ll take cool, crisp sweater weather all year round please! Drew the problem has been solved and our content has been removed from that site. Thanks! Thank you for all of this peach info! Now that they are in season, I have a million! I have lots of good ideas now! Your blog Carrots ‘N’ Cake is great! “Finding the healthy balance” has been very difficult for me my whole life. Your blog is a real inspiration. Such a good year for peach too this year! We’ve had peaches since mid-July here in the Norther (US) Piedmont and they are still coming strong: different cultivars, of course. Right now I am in the process of “putting up” a 1/2 bushel of ‘Georgia Belle’, a white very delicate peach that does not ship well and is, therefore, difficult to find in markets. Another sign that a peach is properly ripe (besides the fragrance) is if they peel easily: if they are ripe, the skin just slide off as soon as you start pulling on it! Thank you for the compendiums of recipes posted here. I myself posted several peach recipes on my blog including peach salsa, white peach sorbet, and homemade-peach liqueur. Let’s enjoy them when they last. ANd they in winter, we can use our frozen peaches to make sauce, pies, cobblers and smoothie. A good way to enjoy a taste of summer, then! Thanks for all the great tips! Sounds like you might well have a few peach trees in your back yard! Peach smoothies are my favorite. I make them with silken tofu, for breakfast. It’s a great way to begin the day!